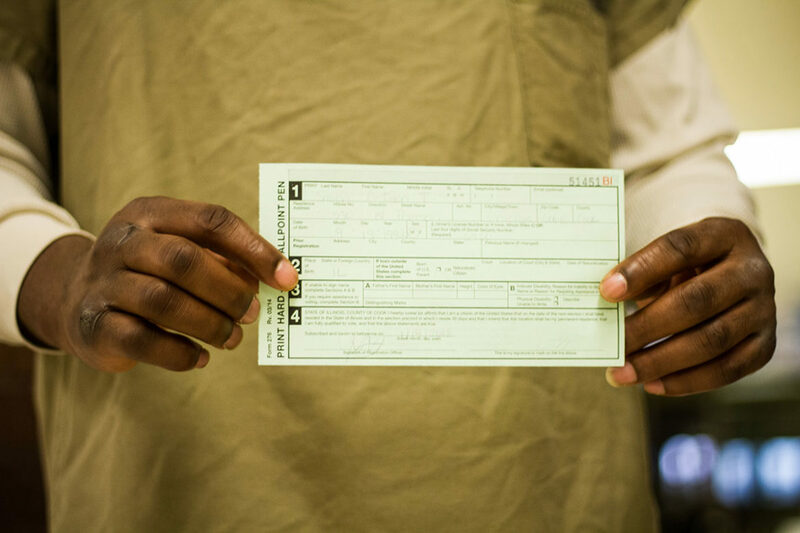 An inmate holds up his receipt for having registered to vote at Cook County Jail, where volunteers with Chicago Votes registered more than 150 detainees to vote on Jan. 14, 2018. Update: Voting rights activists continue to lobby state legislators to support HB 4469 during this month’s veto session. The bill passed with bipartisan support last spring only to be gutted by Gov. Bruce Rauner through an amendatory veto, which removed sections of the bill requiring state jails and prisons to distribute voting rights pamphlets and voter registration information to those exiting these facilities. If no action is taken during veto session, advocates say the bill will be reintroduced in 2019. During her run for state representative in the 5th District two years ago, Juliana Stratton kept hearing the same troubling story over and over again. Residents told her they couldn’t vote because they had a felony record. “I heard it enough times that I just become really frustrated,” said Stratton, now the running mate with the state’s Democratic nominee for governor, J.B. Pritzker. Illinois is among a few states that restore voting rights to individuals once they leave prison. But many ex-offenders say they are unaware that their right to vote returns after completing their sentence, and others say that parole or probation officers often misinformed them. Voting is vital to any community. But communities of color face greater risk of disenfranchisement because of contact with the criminal justice system. These communities are more likely to be over-policed and experience high rates of arrests and detention. And those locked up in county jails are frequently poor blacks and Latinos who cannot afford bail. Stratton worked with local advocates to introduce a bill in February to expand voter access and education among Illinois’ jail population, which is about 20,000 people. But the bill has received opposition from a statewide sheriffs’ association. HB 4469 creates a formal process that allows those awaiting trial in jail to vote. It requires local county jails and election authorities to create a system for jail detainees to register and vote by mail-in or absentee ballot. The bill also establishes Cook County Jail as a temporary branch polling place. If passed, advocates says, Illinois would be the first state in the nation to have a county jail designated as a polling place. That’s significant considering this country’s tumultuous voting rights history, said Jen Dean of Chicago Votes, a youth voting rights organization and one of three groups that helped draft the language for the bill. “In the 1950s and 60s people were imprisoned and jailed fighting for their right to vote, and now 60 years later we are turning a jail into a polling location,” Dean said. That designation, she added, will allow actual voting machines inside the jails as well as same day voter registration and voting, giving inmates the same options as ordinary citizens. For several months, Dean and a band of volunteers have registered eligible inmates to vote at Cook County Jail. Since September, her group registered 1,500 new voters. During March’s primary election 508 ballots were cast over two days of early voting at the jail. The bill, currently in the House election and finance campaign committee, is scheduled for an April 11 hearing in Springfield. It comes nearly a year after The Chicago Reporter showed a lack of uniformity in the state’s election code that could possibly disenfranchise those held in local jails from voting. Many states, including Illinois, do not deny inmates awaiting trial the right to vote. But that may depend on the willingness of jail and election authority officials to allow voter registration and absentee balloting behind bars. Neighboring states like Wisconsin, Indiana and Iowa allow jail detainees to vote absentee, but leave the process up to local sheriffs to determine. HB 4469 aims to provide guidance and best practices on how voting in jail can occur. The Illinois Sheriffs’ Association, however, has raised concerns about the bill. The 102-member association believes the bill will create an undue burden on smaller county jails, many of which are underfunded and understaffed. The head of the Illinois Sheriffs’ Association contends voter registration should not be the function of the jails. “Our primary job is for us to protect and serve the community we represent – not make sure people get a chance to vote,” said the association’s executive director, Jim Kaitschuk. Kaitschuk understands Stratton’s intent, but said to saddle jail staff with this extra duty is not feasible. Staffers at smaller jails, he said, often pull double duty serving as dispatchers and guards. Additionally, he said some small or rural jails house detainees less than a year and have transient populations. Stephenson County Sheriff David Snyders agreed. Stephenson County is located between Rockford and Galena on the Wisconsin border. His jail has yet to recover from 2010 layoffs that saw 27 positions from both law enforcement and corrections eliminated. The remaining 16 officers, he said, work in four 12-hour shifts splitting duties from serving meals, processing mail to guard duties at the 216 bed facility. To add the responsibility to register individuals in custody creates an undue burden, said Snyders who says that in his 20 years as sheriff he never had a request to vote while in custody. Individuals should take advantage of the opportunities to register once they turn 18, Snyders said. In Stephenson County, people can register at the local courthouse, county clerk office and driver’s license facility. “I don’t have an issue with them voting [in jail], but the registration may be problematic,” Snyders said. Stratton is aware of the association’s concerns and hopes they can reach some consensus. However, she said the burden is currently on detainees who don’t have the opportunity to exercise their right to vote. While some counties like Cook and Lake have figured out how to make voting behind bars work, that opportunity is not afforded to others, she said. The bill also requires the Illinois Department of Corrections to provide those released from custody with a voter registration application as well as voting rights information. IDOC supports the bill, which Stratton said she hopes can be on the governor’s desk in May. Correction: This story has been updated to identify Iowa, not Missouri, as a state that allows jail detainees to vote absentee. Illinois is among the few states where formerly incarcerated regain their voting rights after release, but many are misinformed and unaware. Harish Ibrahim Patel’s work is devoted to raising awareness on social issues, big or small, and mobilizing people of all races and ethnicities to become more civically engaged.